I view the world through a food-colored lens and it definitely is a focus when I travel. One of the best things about traveling to lands near and far is the discovery of unique dishes. The world is a smaller place these days and you can get just about anything anywhere, so it is really cool when you can try a truly local dish in the place it was created. And in Hilo, Hawaii, that dish is loco moco. I am not going to tell you it is gourmet. I am not going to say it is good for you. But I will say it is unique, delicious and worth a try. 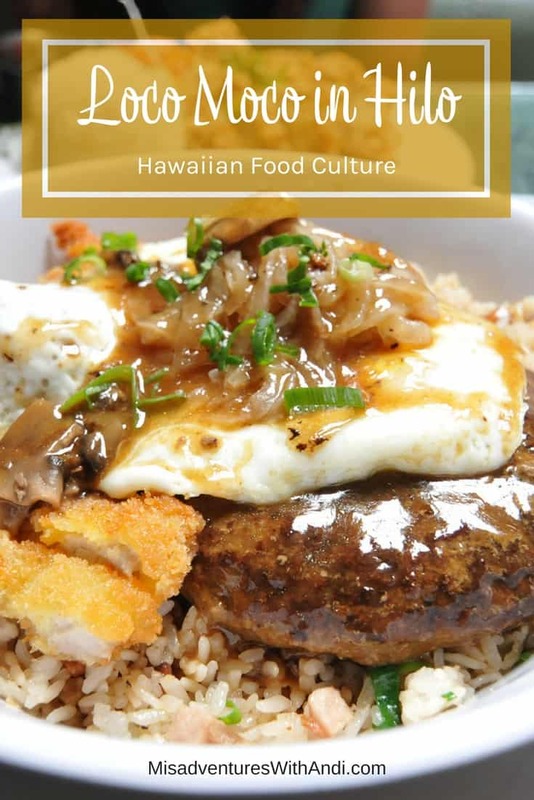 On my first trip to Hilo last March I didn’t have the opportunity to check this dish out, so on my trip last month I incorporated loco moco into my plans. The dish was created in 1949 at the Lincoln Grill (which closed in the 60″s). Local kids hanging out at the restaurant after a football game were doing what teenagers usually do, being loud, causing trouble and Nancy Inouye (one of the owners) yelled at them asking why they never ate at the restaurant. They said they couldn’t afford it and asked that the owners to come up with something faster and cheaper than the traditional bento boxes and hamburger steaks that were available. I have been reading a lot about Hawaiian history and in the ’30s and ’40s high school football support was at a frenzy. Four-year universities in the islands (and the athletics that came along with schools that size) came late, so high school football players were treated like gods. So when the Lincoln Wreckers Sports club asked for a new dish, it isn’t hard to imagine Nancy jumping on their request, putting some rice in a bowl with a hamburger patty and then topping it with brown gravy (the egg came later). And thus loco moco was born. > The teenagers named the dish Loco Moco after one of their members whose nickname was “Crazy.” (Loco in Spanish) They tacked on “moco” which rhymed with loco and sounded good. > “Loco” was merely the use of Hawaiian Pidgin, and meant “Local.” And Moco was added on to rhyme. 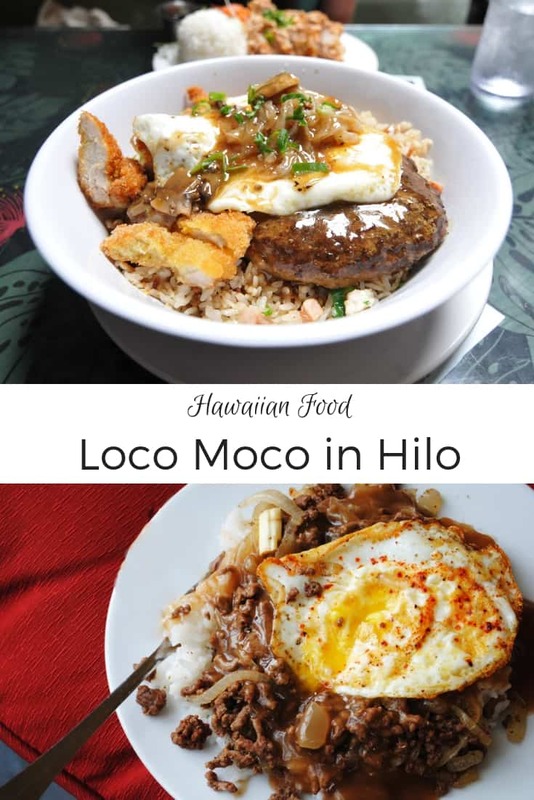 Needless to say, whatever its exact origin, Hilo is where loco moco was born and Hilo is a great place to explore its history. From 1949 onward it has been a constant on the menus of many Hilo restaurants as well as throughout all the islands. 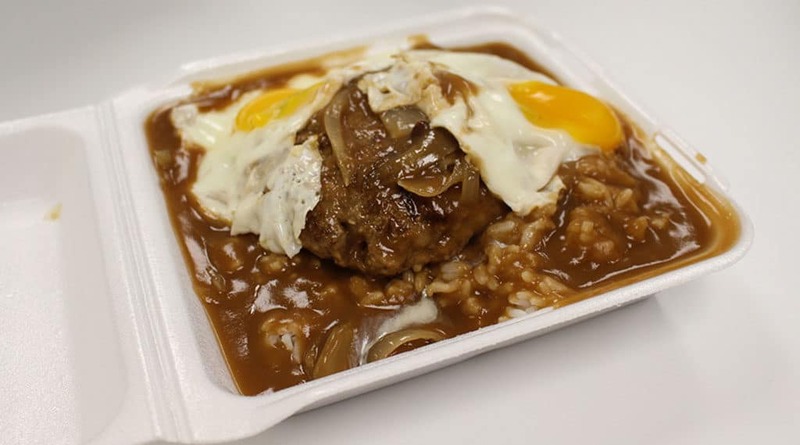 These days there is a huge variety of loco moco with all kinds of deviations in meat, rice, gravy you name it. I think you would need to spend at least two months to get through all the types of loco moco available! I had big plans for my loco moco adventures in Hilo. I researched. I studied. I mapped out when and where I would tackle my targets, but in the end, I could only manage to eat it twice. Loco Moco is delicious, but it is a lot of food. And heavy food, and I didn’t want to leave Hilo a hundred pounds heavier. 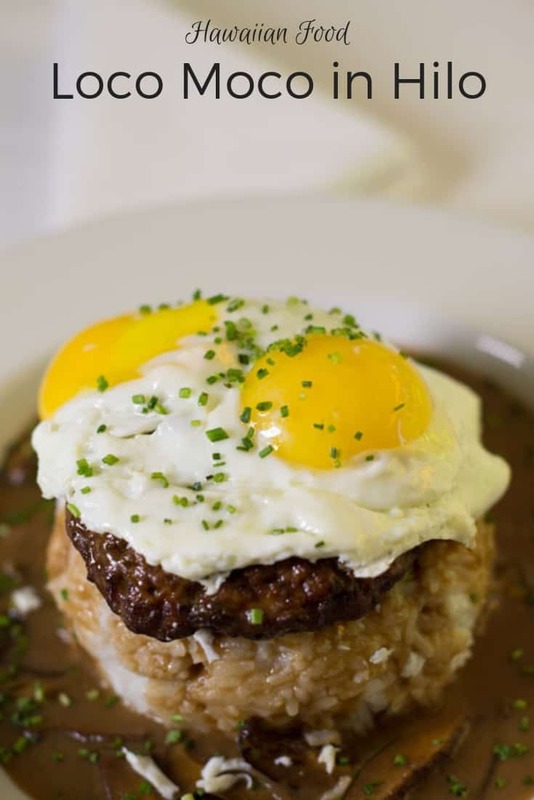 Loco Moco is not a dish you eat every day! > Café 100, 969 Kilauea Avenue one of the oldest restaurants serving loco moco. First stop was Kuhio Grill, a truly local spot discreetly placed in a shopping center, hard to find if you aren’t really looking. My guess is they like it that way. I am pretty sure I was the only non-local in the restaurant. The wait staff is super friendly and I needed plenty of time to review the menu, it is massive! After a gentle reminder that I was there for loco moco, I placed my order for a chicken katsu version (I wasn’t quite feeling a desire for a hamburger that night). If there is an illustration associated with the definition of “umami” it is the gravy that Kuhio Grill serves over their loco moco plate. I ate quite a few bites of just gravy before digging in deeper to taste the katsu chicken and fried rice. I kept going in for spoon after spoon and didn’t stop until it was already too late. I ate way more than I should of and was stuffed for many hours! My first loco moco? Yeah, it was a hit. The next night I went to Café 100, one of the oldest restaurants serving loco moco. I got the original classic: rice, hamburger patty, and gravy, with an egg of course. It came in a human-sized portion. 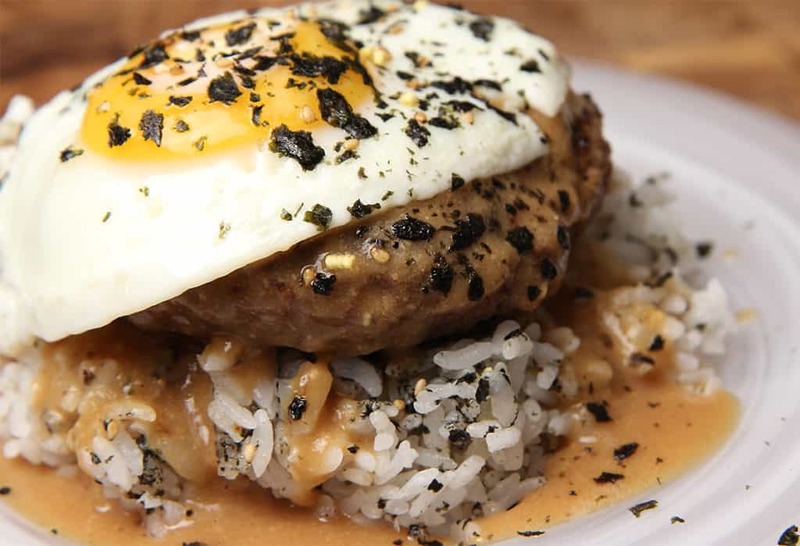 I think I had been avoiding the original version because I grew up eating Salisbury steak which I hated and I think loco moco with hamburger reminded me of it. And while I do think I prefer other proteins, this was really, really good. I am a sucker for gravy, especially brown gravy, I had that a lot as a kid over mash potatoes or rice and loved it, still, do. The Café 100 version is the real deal! P.S. They have great beef stew too! I did also end up at Hawaiian Style Café when I had lunch with Megan (who I met last year in Hilo) but I ended up ordering a mixed plate [Check out my post on the mixed plate on the Hawaii Visitors and Convention Bureau blog, So Much More Hawaii]. I did witness a couple of people trying out their famous loco-moco-saurus, a MASSIVE portion! Also, the hubby had breakfast at Ken’s Pancake House where he had a “slam” omelet. He constantly calls SPAM, slam, it’s so cute! He missed out on a great loco moco experience, they are supposed to have the best gravy in town. 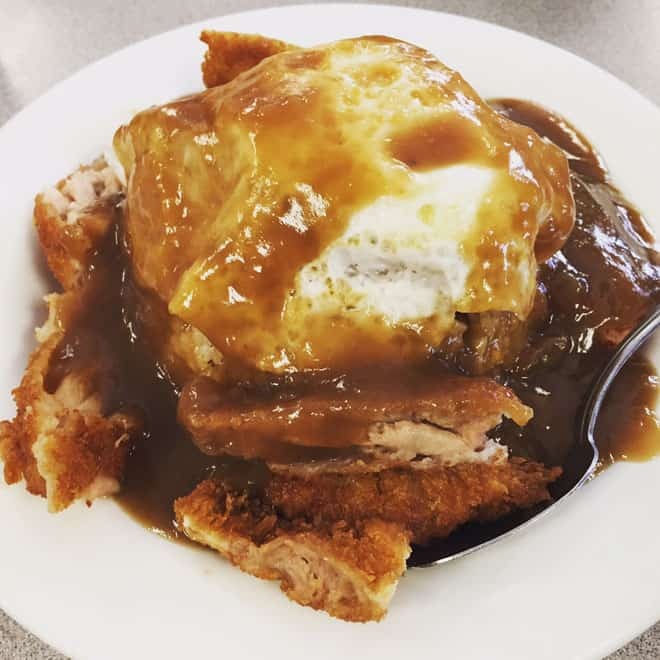 There are a ton of diners and drive-ins in Hilo and most of them serve a version of loco moco, so like I said, you can try different ones for weeks! > If you have loco moco on the agenda for the day, skip the meal right before. If you plan to eat it for lunch, skip breakfast. Dinner? Skip lunch. Trust me on this one! > Try the original first before trying any of the other varieties. It is a classic for a reason and a good source of comparison. > It’s all about the gravy. Read reviews. If people rave about the gravy, get a move on. If people say it’s “ok” skip it and try someplace else, I think the gravy makes or breaks the experience. > Spread out your experiences. I ate loco moco two days in a row then I was kind of over it. It is delicious but heavy so spread out your meals and your experiences, you will enjoy it more. > Buddy system. These plates are massive, go with a friend and share one plate, you will feel better about yourself! How about you? Any more tips to add? I really like this post from Big Island Guru, check out Letting your taste buds go loco. 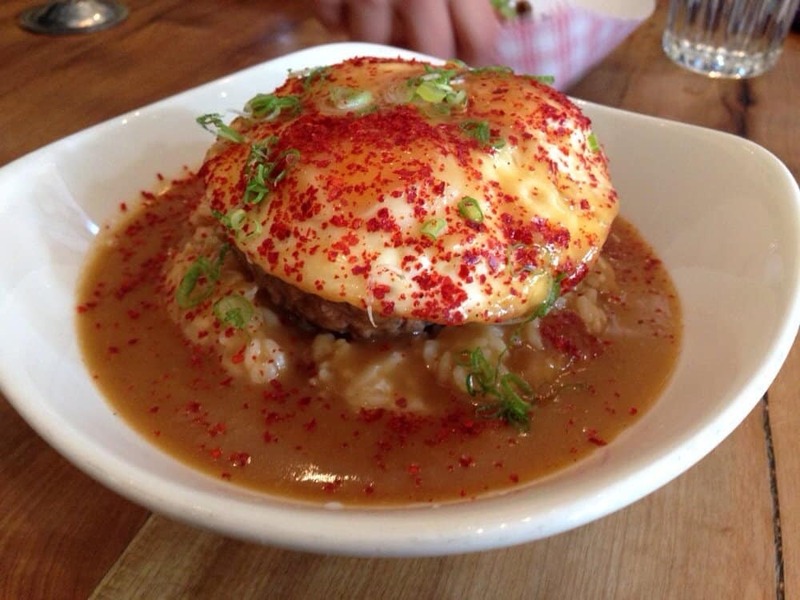 Namu Gaji loco moco, photo credit: Jess C.
Have to plug my hometown! 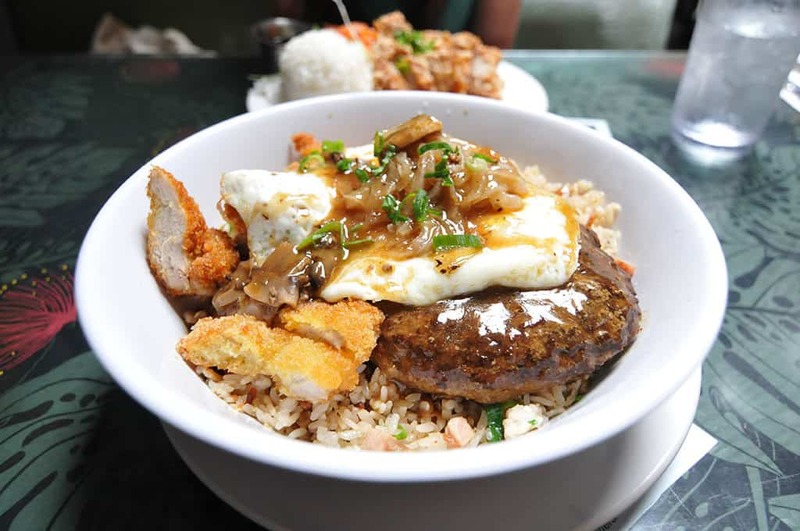 There are several places in the city that have great versions of loco moco including Namu Gaji, Grindz, and Aina. 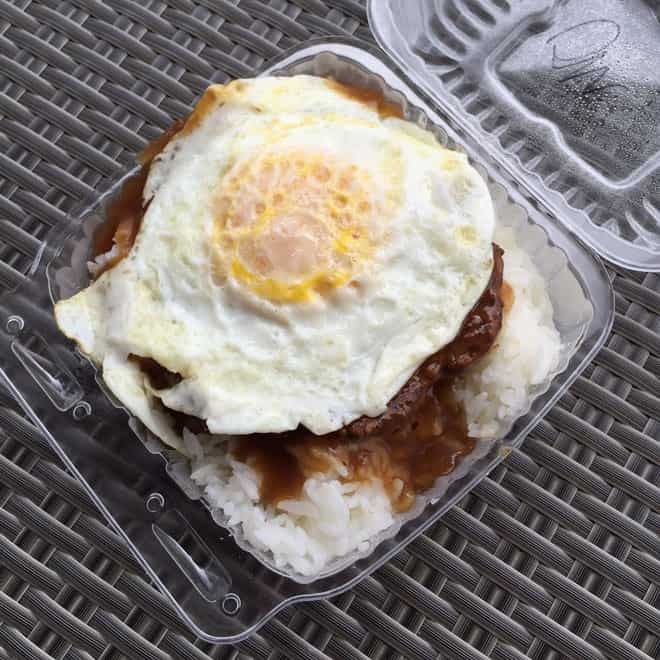 Check out my post on Hawaiian food in San Francisco for more places that serve loco moco and other Hawaiian food dishes. How about you? Have you had loco moco before? Where? How? What do you think? Looks like an amazing dish to try! 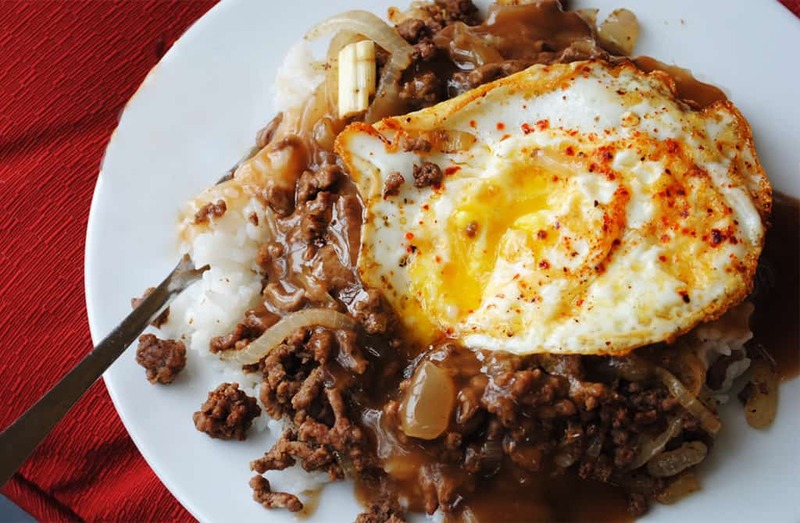 How does the egg blend with the rice and beef? 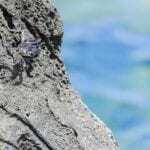 It looks like it could be quite the adventure in textures! I will have to try it, if I ever get a chance. @Jennifer, the egg mixes into the gravy and adds a deeper riches to the gravy, it is quite a unique dish! I’d love to go to Hawaii one day for the food and the beach life. I’ve never heard of loco moco before but now that I have, I’d love to try it. This looks like it was a great trip. All of the food looks so delicious, I think I need to make some breakfast this morning after reading this post. Wow, I’ve never heard of this! So many variations, and I can see why you say to skip a meal beforehand (or skipping the next one would work too, which is what I do after a full British breakfast)! On the list to try next trip to Hawaii! I like the name they gave the dish. 🙂 It’s catchy and fun and everything looks great! I’m a sucker for brown gravy, too. All the Loco Mocos you featured looked delicious. I will make this my mission too if I will have the chance to visit Hawaii. One thing I also love about travelling is tasting and discovering new dishes! Yes, that gravy looks delectable without a doubt. I agree with you that trying local dishes is one of the best parts of traveling! Ooooo everything looks so delicious!!! Being a totally foodie, I wish I was a tad bit closer so I can try myself! Yummy! Honestly, I had no idea about any of this! It was fascinating to read your post and learn all about this dish, and now I need a trip to Hawaii — or at least San Francisco! — to taste it. All these different version look good. I have never thought to put egg on top. Sounds Delicious. 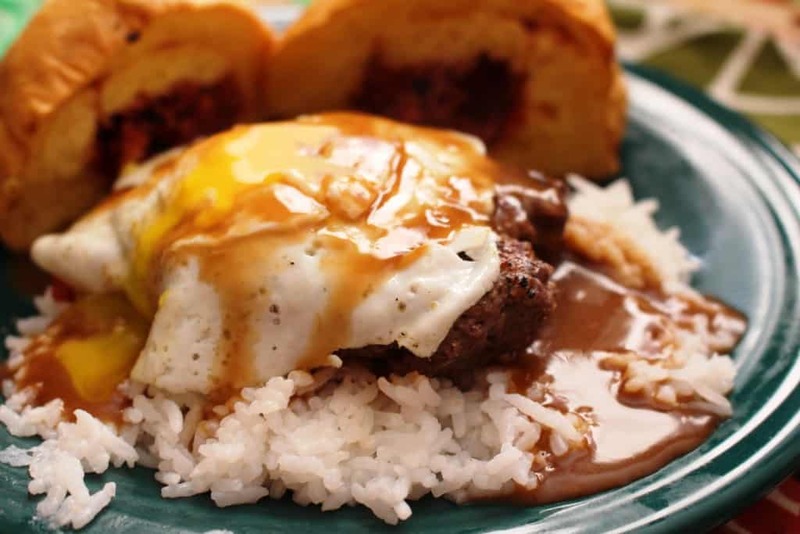 Gravy, rice, egg, fried chicken and so many more twists on loco moco – oye I am not sure whether to love it or become dizzy with the crazy combinations. I think I might have to seek this out in December during my next trip to Oahu just to say I have! @Kelly, sloppy, good and comforting! Everything looks so delicious and thank you for sharing this with us! 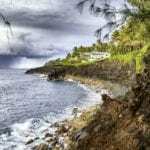 I am in a romantic love affair with Hawaii!! Ive always wanted to go and dream of going there one day!! Im mentally sold that I’ll just adore anything and everything it has to offer!! Even this looks amazing!! yum! you are making me hungry!!! i’ve always wanted to go to Hawaii! the foodlooks so delicious. @Chloe, all I think about is the food there. I went four times in the last year and never went to the beach, just ate! Loco Moco is one of the dishes that I crave when I visit Hawaii (along with poke and butter mochi). Last time I went to Maui I found one of the best versions I’ve ever had at Local Food, a small take-out counter in a strip mall that I wouldn’t have thought about twice. Had to tell you I had a Crabcake Loco Moco today (5/7/17) at Pacific Catch in Dublin, CA and for my very first one it was fabulous. Right now the restaurant is featuring Hawaiian food so my friend and I both had it. The crabcake was very big and full of crab, topped with a moco sauce, which was excellent, and served over white rice with a little spicy mango salsa! Again, it was so yummy and I cleaned my bowl!! 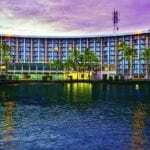 Thanks for the food tips on your Hawaiian blog you reposted recently.